Firstly, I'd like to sincerely apologize for lagging behind on posts. It's been kinda crazy on my end (big, big news!) -- Marcus and I are moving in together, to Roosevelt Island to be exact, in less than a week! As such, we've been spending the last few weeks getting everything ready for the move, so I'm quite behind (more than I like, anyhow) on blog posts. Please forgive me -- I'm working on them as best as I can! Anyways, early last month, Marcus and I stopped at Social Eatz, Chef Angelo Sosa's American-Asian restaurant. Chef Sosa was the runner-up in Season 7 of Top Chef that took place in Washington, D.C. He began his career as a chef. After graduating with High Honors from the Culinary Institute of America, Chef Sosa worked with Chef Christian Bertrand as well as Chef Jean-Georges Vongerichten. 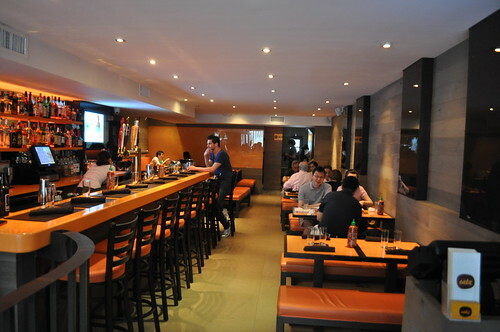 A few years later, he began consulting other restaurants with his expertise, particularly in Asian cuisine. His consulting work includes Stephen Starr’s Buddakan, Asian-Mediterranean hot-spot LOFT, Morimoto, and Alain Ducasse’s Spoon. 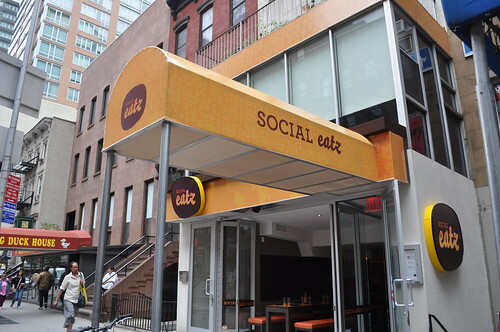 Social Eatz is Chef Sosa's most recent project as both executive chef and owner, where he designed a menu that reinterprets New York City staples with flavors from across Asia. 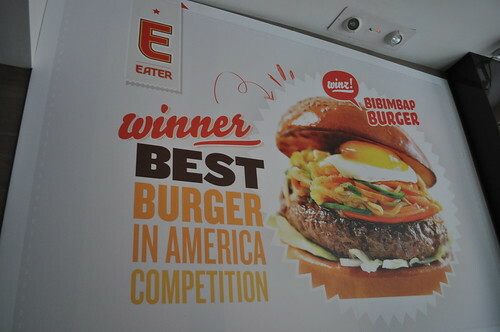 In fact, Eater named Social Eatz's bibimbap burger (never even knew this kind of burger existed!) as the winner of "Best Burger in America" competition. 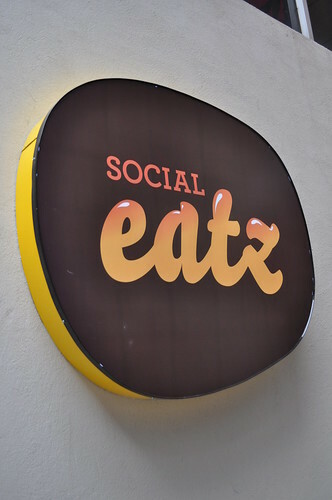 Inside Social Eatz -- definitely has a trendy, contemporary diner vibe to it. Love the orange and black! 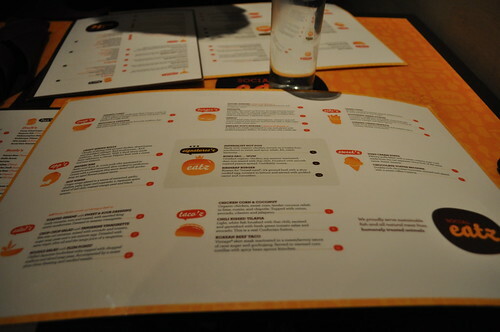 The menus almost looked like diner placemats! Per our server's suggestions, I opted to start off the meal with a cocktail called the carrot & ginger fizz, consisting of 2 ounces of Stoli orange mixed with "vibrant" carrot juice, a touch of Canton liqueur, and a zetz (Yiddish for a "strike" or "hit") of yuzu juice. Overall, I thought the carrot and ginger infusion was very refreshing, but found the alcohol content to be a bit strong and overpowering. Maybe I'm not the best vodka drinker, so I may not be the right person to consult on such matters, haha. Marcus started with the yuzu collins, a cocktail consisting 1.5 ounces of Bombay Sapphire gin blended with tart yuzu juices, "citrussy" Cointreau, and a capful of pure cane syrup, finally ending with a "splash" of soda for the flavors that "sparkles." Quite the mouthful right there! Marcus thought this cocktail was just okay, mainly because he wished there was more citrus flavor and less alcohol. The inspiration was definitely there, just needed some tweaks in execution. There was no way I was going to leave Social Eatz that evening without trying the famous bibimbap burger. Bibimbap is actually Korean for "mixed meal," as the burger here had the typical bibimbap mix of ground beef with a slow-cooked egg, covered in lettuce, and served with pickled carrots and cucumbers. I actually really liked the composition of the burger in that, instead of being served in its traditional dolsot (i.e., a very hot stone bowl) in which a raw egg is cooked against the sides of the bowl, it is encapsulated (as much as it can be) between two toasted burger buns. Even though the size of this burger was quite overwhelming, it had all the full, hearty flavors that you'd find in a dolsot bibimbap, maintaining its authenticity in a more modern vessel (i.e., sandwich-form). If you do come to Social Eatz, I highly recommend this burger, as it is the restaurant's signature dish. My only warning, though, is that it is very sauce-laden, so make sure you have your plate underneath every bite so it catches any dripping sauce without ruining your finest pair of slacks! Marcus ordered the kung pao sandwich with soy-sesame-marinated certified organic chicken that was iron-seared with Thai chili and finished with smooth roasted peanut spread, which the chef refers to on the menu as "certifiably insane." 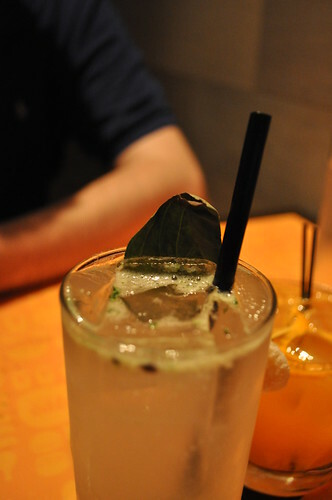 Marcus enjoyed it very much, primarily for its sweet and spicy flavors. His only gripes about the sandwich were that the chicken kept slipping out (making it very difficult to eat evenly between the two bread slices) and that it was really drenched in sauce (also making it difficult to eat). So again, beware of the dripping sauce that comes with sandwich/burger territory at Social Eatz. 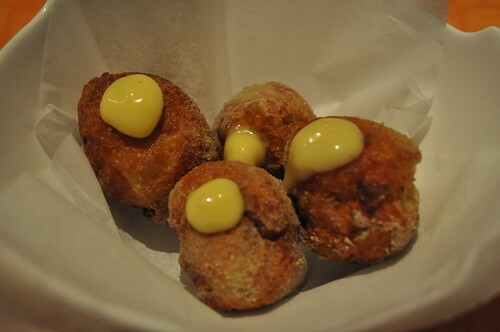 For dessert, Marcus and I ordered the yuzu cream puffs, which were "pillowy" puffs filled with a sweet and creamy yuzu curd, adding the tartness of the yuzu citrus fruit. These were disappointing for us in that the cream puff dough was kinda inconsequential (i.e., not at all fluffy as it is supposed to be), and the curd-to-puff dough ratio was also very weak -- not a very good balance. Overall, the dessert didn't really stand out to us all that much. Hopefully just an off-day. 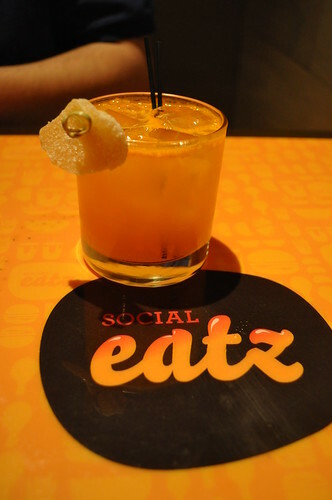 Findings: Definitely loved the casual and welcoming atmosphere at Social Eatz. The cocktail selection was very interesting with many Asian flavors infused in some unique concoctions -- just a little bit heavy on the alcohol. If the bartender lets up a little bit, the cocktails would go down a tad easier. 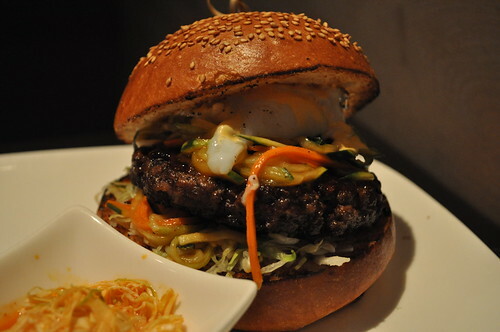 The bibimbap burger is a must-order for sure! The runny yolk of the egg mixed in with the pickled veggies on top of the burger definitely made the experience for me. Going just for this famed burger is worth it for sure! 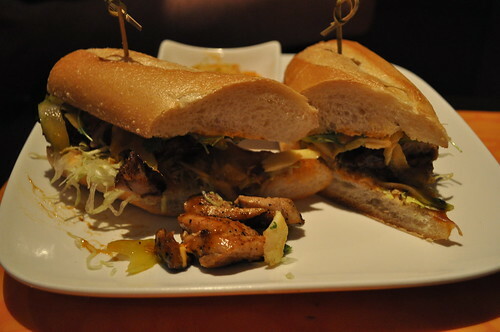 The kung pao sandwich was pretty good, too, but I advise skipping dessert and substituting a appetizer. Chef Sosa has a really fun concept going on at Social Eatz -- perhaps there will be some newer items appearing on the menu sometime soon! Price point: $13 for each cocktail, $9-12 for each main course, $6 for dessert.